Widewater is a landlocked brackish lagoon approximately 1200 metres long and 50 metres at its widest point when the lagoon is in flood. It was created by Man from the original Adur estuary after been landlocked by longshore drift and violent storms. The waters are replenished by the sea, which filters up through the basin of the lagoon on very high tides, and also by rain water. There is a dramatic rise in the level after heavy rainfall, more than can be explained by the rain landing directly on the lagoon flood plain. Man has built up banks on the perimeter of the lagoon to prevent flooding to this nearby reclaimed land, now turned to residential use. The quantity of water contained within the lagoon and salinity are liable to fluctuate wildly. The flood plain covers an area of 18.5 acres. Since May 2013 a pipeline has been installed to supplement the water levels in Widewater during the summer when the water levels would previously fall to a very low level. 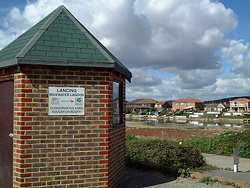 This area can be reached from Shoreham-by-Sea railway station following the purple route on the Map. Click on the underlined text. Hoglice Idotea chelipes (=I. viridis). One species of this large woodlice-type crustacean has been identified from the lagoon. It is an inhabitant of non-tidal lagoons and can tolerate full salinity to almost fresh water down to 0.4%. It will also inhabit the pools that are cut off from the main body of the lagoon during the summer. 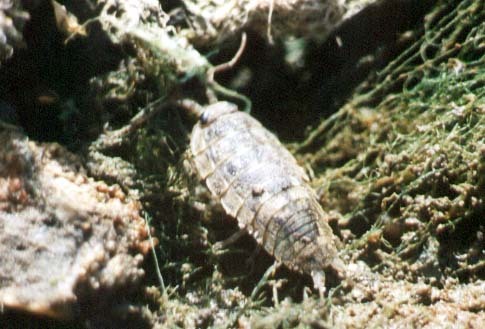 The largest of the British wood lice feeds on decaying vegetation at the margins of the lagoon. 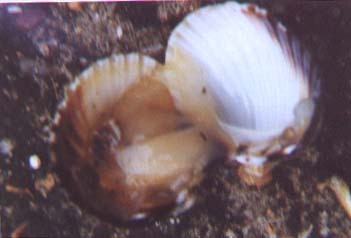 A recent survey (1997) has rediscovered this cockle which resembles the Common Cockle, Cerastoderma edule, but has a much thinner shell and is only to be found in brackish water. Lagoon Cockles have byssus threads and I found juveniles often attached to seaweeds and other substrates. I never noticed byssus threads in Common Cockles. 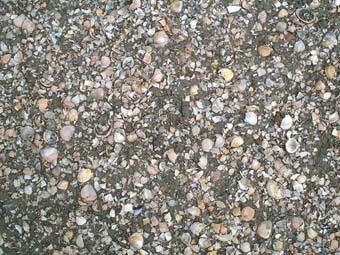 Grown Lagoon Cockles may bury themselves as well, but never so deep as Common Cockles. A recent survey (1997) failed to discover this sea anemone and it has now been pronounced extinct. It was last recorded in 1983. The 1997 survey by Robert Irving took 8.5 cm diameter cores from various positions (about 10 in all) throughout the lagoon, marked on the site map in the Report. Cores were to a depth of approx. 8 cm, but also surface scrapes into polythene bags under water, probably the top 5 cm or so. A search will be undertaken next summer. See notes. This sea anemone is protected under Schedule 5 of the Countryside and Wildlife Act 1981, but a proposal has been penned to remove it. The grid ref for the collected specimens was TQ 202 043. As the anemone may still be extant, the proposal to remove the sea anemone from the list has now been removed. There is a possibility that the above sea anemone was a deformed specimen of Haliplanella lineata (my surmise AH). This latter typical brackish water sea anemone has been discovered and identified in July 2002. A rarely recorded brackish water hydrozoan is found in brackish water down to a salinity of 0.8% and its only habitat of note in the United Kingdom is the Widewater Lagoon, where it is found attached to the seaweed Chaetomorpha linum and Ulva. This hydrozoan does not have a medusa stage. 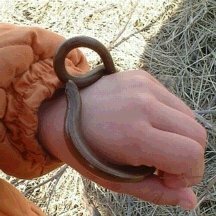 It grow to a length of 30 mm. This species has been discovered in the Kiel Canal and probably occurs in the Baltic Sea, a traditional and current trading area with Shoreham Harbour. It is possibly an alien species introduced a long time ago, although Widewater has been cut off from a direct link to the sea for over a century. The numbers of this hydroid may be reduced by the 3-spined Sticklebacks. The 1997 survey failed to discover this hydroid. The species was added to Schedule 5 of the Wildlife and Countryside Act 1981 in 1998, after being penned for inclusion in August 1996 (included in Torpedo Issue 5). The origin of this hydrozoan is apparently unknown and the only recent records come from Widewater Lagoon and several localities in the SW Netherlands. In the past is has been recorded from ship's hulls in Cape Town (South Africa) and from one locality in the Baltic near Kiel (Germany). Its present name is Thieliana navis. It seems to prefer a salinity of about 20 ppt. It grows on boulders, invertebrates, algae and plants. In the Netherlands and GB it occurs in enclosed man-made water bodies of relatively recent (last century) origin. There do not appear to be any large winkle-sized gastropods living in Widewater. This is interesting as it appears as one of the stages in the life cycle of the flatworm Cryptocotyle lingua. The algae in the lagoon includes the annual Cladophora illustrated above. The Sticklebacks make their nest amongst it in the spring. By late summer, it breaks free and forms a mat on the surface of the remaining water. Glasswort, Salicornia, grows on the margins of the lagoon where patches turn red in autumn. There are several species but this plant is so variable in appearance that it will need experts to distinguish them to species level. 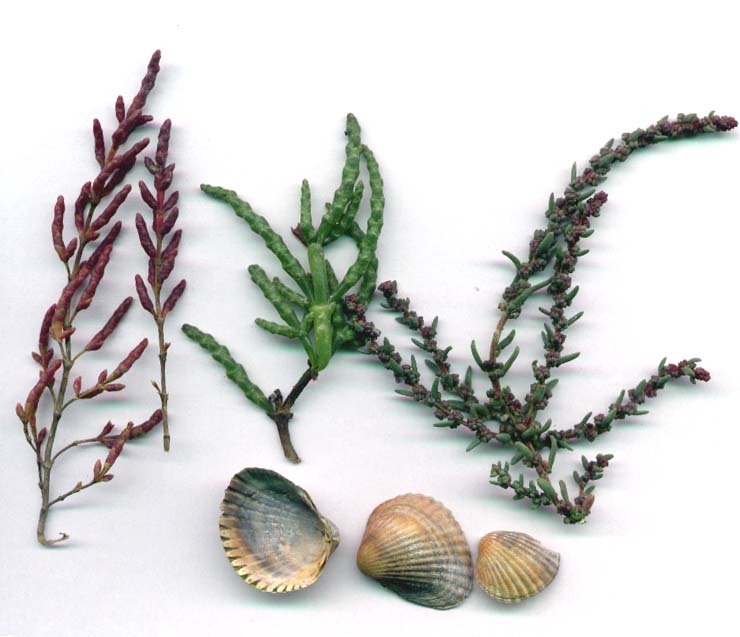 The plant on the far right is the young shoots of Sea Blite, Suaeda maritima. Sea Heath, Frankenia laevis, was recognised in 2000, in a area that had previously been fenced off to the public to protect the breeding area of the Ringed Plover. A large patch of this plant was discovered. This plant is very rare in Sussex known only from Rye Harbour, but it has possibly been missed on the fringes of salt-marshes. This plant has now been found be a genuine wild specimen and NOT a garden escape. It was already listed in Betty Bishop's, Flora of Shoreham-by-Sea (1984). Floating on the surface the strands of the rooted plant with the scientific name of Ruppia maritima were pointed out. This is an unattractive choking style green flowering point that was present in large clumps. A naturalists meeting at Widewater Lagoon (meet at the Information Booth) with Professor Richard Ivell and an attempt to discover the sea anemone Edwardsia ivelli. 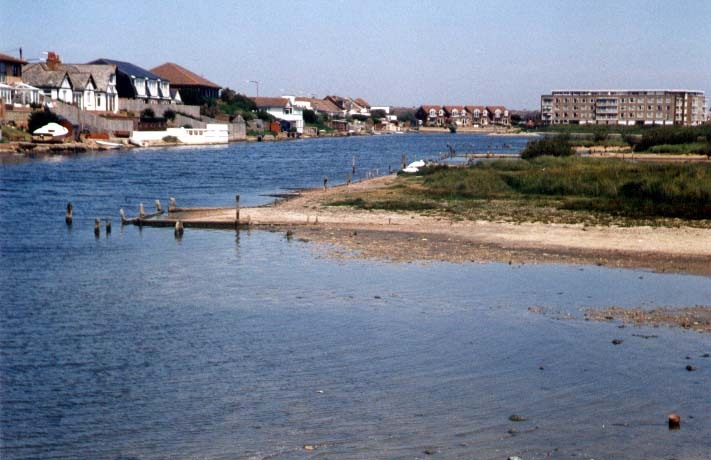 A Public Meeting was held at Lancing Parish Hall to discuss with the Environment Agency the effect shingle movement is having on water levels in Widewater Lagoon. There are presentations by Rupert Chubb (Flood defence Manager, Environment Agency), Derek Neate (Friends of Widewater Lagoon) and Councillor Tony Nicklen. There is some rather puzzling engineering work going on on the shingle foreshore at the eastern of Widewater Lagoon, which seems to also involve an offshore ship of some kind. Shingle and water is being pumped over a small section of the beach. The photograph on the left shows what looks like mainly coloured water coming out the pipeline which is discolouring the sea, but a lesser extent than the water discharges from Shoreham harbour on to Southwick beach. Engineers have begun the first stage of the seawater pipe installation at Widewater Lagoon. The sections black plastic pipe are being joined by a heat welding machine. The process takes about one and a half hours for each section. Two joins have been made, there will be about twenty more joins to complete the pipe which is designed to allow topping up of the lagoon should it suffer lack of water in summer as a result of the sea defence works currently in progress. The site of the installation is being plotted on the ground towards the west end of the lagoon. The work is expected to be completed in March 2003. The best bit of Ringed Plover nesting habitat and the most attractive bit of the flora (Sea Thrift and Stonecrops) of the lagoon fringes has been churned to pieces. The location of the pipeline was changed at the last minute. The top soil/gravel is meant to be returned in the place from where it was removed. The new rock defences on the shingle beach are erected on Widewater beach with rocks* brought in by barge across the North Sea from Norway. Five great heaps of rock looking like small volcanic islands sat on the beach the last time I looked. Each waiting to be sculpted into a new groyne structure. 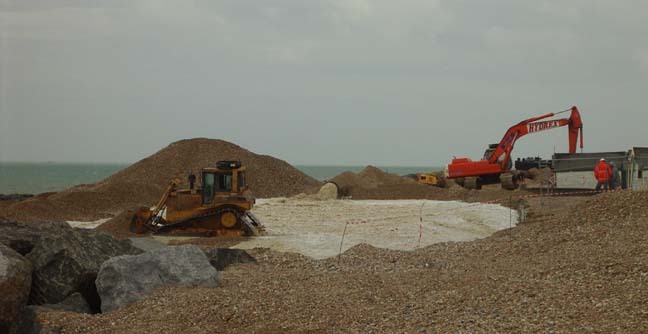 I stood watching the contractors as they were using a mechanical claw to set rocks into place in a mound that will become one of the new groynes. It was extraordinary to see how much effort went in to get one piece of rock to fit exactly the right position at the top of the newly formed mound. Imagine having to build a rockery with pieces that weigh several tonnes each. All the exposed pieces, it seems, must be secure and form an overall smooth appearance, so that if you take a line and hold it against the mound, no individual rocks break the line or leave a large hollow. Or perhaps imagine if it were rendered with cement, a rock would not protrude through. That seems to be the degree to which construction was taken. One piece of stone was tried, rolled, twisted, turned and finally rejected and another selected and the process repeated until just the right fit was obtained. There must be a huge safety factor at stake here. If one piece of rock was not quite secure, a person could be trapped and maimed by an unexpected shift if they inadvertently found the loose piece. WILDLIFE REPORTS 2004 ET SEQ. After over 40 mm of rain the previous day and over night, the water level of Widewater Lagoon on the gauge by the bridge is 1 m 66 cm, the highest level recorded in 2003. The water level of Widewater Lagoon on the gauge by the bridge was 1 m 63 cm. At the high spring tide a Little Egret was stationed by the inlet where the water was flooding in. Despite over an inch of steady rain in the last two days and some high spring tides, the level of Widewater Lagoon has only risen to 1 m 58 cm. The salinity shows no change from the beginning of the month and is recorded at 25‰ (ppt). Thrift is still in flower in small clumps on the grass near the Information Kiosk. A larger than normal chirm of over 30 Goldfinches made an attractive display amongst the dead Burdock on an overcast day. It is the Burdock fruits that are brown globular burrs that stick to clothing and anything else. After thus dispersing its seeds, this biennial plant (purple in flower) then dies. After nearly 25 mm of rain in the last three days and the high tides, Widewater is in flood and the spit at the east end near the island is completely under water. The height reading is 1 m 65 cm. This level is higher than at any time this year. There were at least three Redshanks feeding in the Widewater shallows at the eastern end of the lagoon. (The Redshanks have a longer beak than the Turnstone.) The Goldfinches were present in two small chirms of under a dozen birds each. A single Turnstone roosting at dusk with the thirty Black-headed Gulls looked slightly incongruous. It rested on the narrow spit on the seaward side near the island at the eastern end of the flooded lagoon. When the gulls took to the air, it remained alone. Three Stonechats, one Little Egret and two Sandwich Terns were seen at Widewater, Lancing. The first chirm of about a dozen Goldfinches flew rapidly amongst the shrubbery between Widewater Lagoon and the beach huts, and and a young (brownish) Brown Rat was seen in the reduced undergrowth next to the promenade above the inlet pipe. It is surprising how full Widewater Lagoon can look after just a small rise because of the percolation and sea rushing through the inlet. The water spreads out over the flat flood plain, submerging most of the Glasswort. The Little Egret was darting its beak into the shallows actively feeding. The small prawns were most likely its prey. Over the gravel near the inlet a Clouded Yellow Butterfly flew in the moderate north westerly breeze on a sunny 16.2 ºC (max) afternoon. Wild flowering plants in short supply included Hawkbits, Scarlet Pimpernel, small very blue clumps of Viper's Bugloss, the very occasional Bird's Foot Trefoil and Sea Campion. The breeze blowing from the north against the high tide caused choppy conditions in the sea, but it veered around from a completely opposite direction from the south-east in the late morning. The inlet pipe to Widewater Lagoon has not been detrimental to the autumn Glasswort, Salicornia, as if anything the splendid and unusual scarlet fringe to the lagoon is even more dramatic than usual. 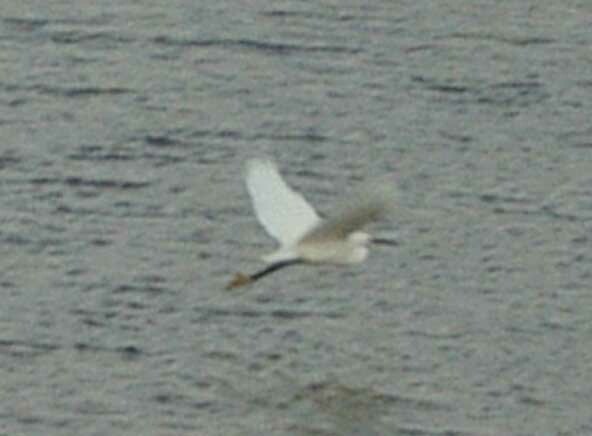 A large Little Egret was feeding to the west of the bridge. Widewater Lagoon was at the highest I had ever seen it, completed flooded on the available flood plain at the east end, and west of the bridge, the red Glasswort is almost totally submerged. There were tens of thousands of very small prawns, but I still have not seen a single Stickleback this year. There was a single female Wheatear over dry land near the lagoon preparing to start her long migration to Africa. There were also a few small buntings (small birds) possibly Corn Buntings near the inlet pipe. The Little Egret is absent from Widewater Lagoon. 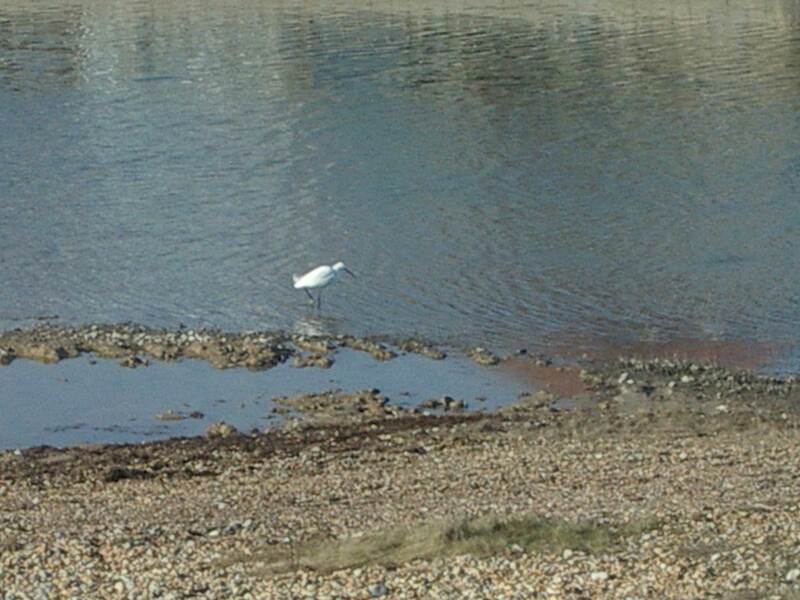 A Little Egret was feeding near the Railway Viaduct on the River Adur estuary at low tide. A very large moth entered a house next to Widewater Lagoon. It was not identified, but it was very likely to have been a Convolvulus Hawk-moth, Agrius convolvuli. There has been an influx of these immigrant moths in Sussex. The lagoon level was as high as seen in winter. The area where the Glasswort, Salicornia, shoots would be poking out of the mud, was submerged. The seawater is flooding into Widewater Lagoon through the inlet on the high (over 6 metre) spring tides. It will be interesting to observe the effect of the artificially raised water level on the colour and prevalency of the saltmarsh plant Glasswort, Salicornia. 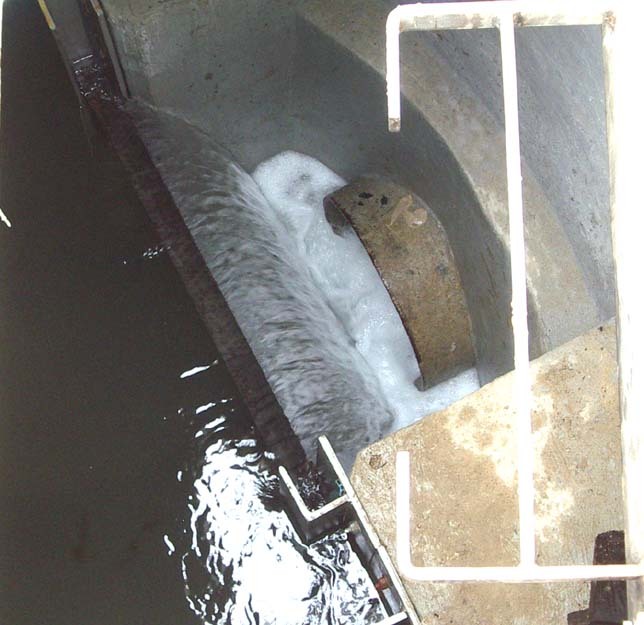 Widewater Lagoon is being maintained at a winter high level by allowing seawater in through the inlet pipe, maintaining a salinityof full strength seawater. A handful of Common Blue Butterflies fluttered over the shingle, the reduced overflow of the flood plain because of the raised level, and an Emperor Dragonfly flew at about six metres above the surface. The green weed Enteromorpha, and possibly some Sea Lettuce, Ulva, could be seen but the lagoon was not very attractive. The combination of the high tides and the new inlet pipe have resulted in Widewater Lagoon being in flood comparable to winter. The flood plain wild flowers are under threat from the saline conditions, possibly including the Sea Heath, Frankenia laevis. There were thousands of tiny prawns, lots of bubbles at high tide, but no Sticklebacks to be seen. A close look in the shallows by the footbridge over the lagoon and it did not look very attractive: the water was more orangey than normal, there seemed to be excessive silt, the Cladophora (green cotton wool-like weed) seemed to be absent and where the shoals of 3-spined Sticklebacks used to be, there were prawns. The weed present was a going brown and it looked like Enteromorpha or Ulva, the latter known as Sea Lettuce. Speculation: both Mute Swans and prawns could eat the Cladophora? The ecology of Widewater Lagoon seems to be changing. One filamentous green weed is missing and the shoals of 3-spined Sticklebacks, Gasterosteus aculeatus, which were one of the most obvious and easily recognised feature of Widewater for the last fifty years or more, are no longer to be seen and seem to have been replaced by small prawns. In the last week, several huge, two metre long? 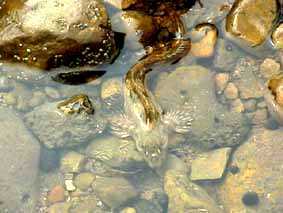 plus Eels, Anguilla anguilla, were seen in the small pool near the input pipe thrashing about in the muddy shallows. The width of the bodies were larger than could be grabbed in one hand. The sticklebacks were not decimated in the dry summer of 1996 as I have recorded them in their normal numbers since then, probably two or three years ago. The last positive record was in April 2002 of sticklebacks being gulped down by the Little Egret. 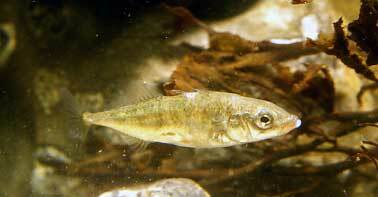 However, the Sticklebacks were completely missing for summer of 2002. The disappearance of the Cladophora could be important as the sticklebacks bred amongst this weed and used it for their nests. The resident Little Egret was repeatedly feeding in the shallows; I attempted to but I could not identify what it was feeding on. There was not an abundance of prawns in its feeding area. There was handful of Gatekeeper Butterflies in the taller vegetation on the fringes of Widewater and a few Large Skippers. These skippers were small and looked like Small Skippers until examined close up. There are a lot of small black insects around, especially the flies by Widewater Lagoon. A Gatekeeper Butterfly by the Information Booth (TQ 204 042) is my first record of (TQ 204 042) this very common (in July and August) butterfly at Widewater or on Shoreham Beach on these Nature Notes. However, it is possible that its very abundance means that it is not mentioned. The beach area lacks the trees and bushes favoured by the Gatekeeper. A Painted Lady Butterfly flew in off the sea and I nearly collided with a Poplar Hawk Moth on my bicycle near the Information Booth at Widewater Lagoon (TQ 204 042). 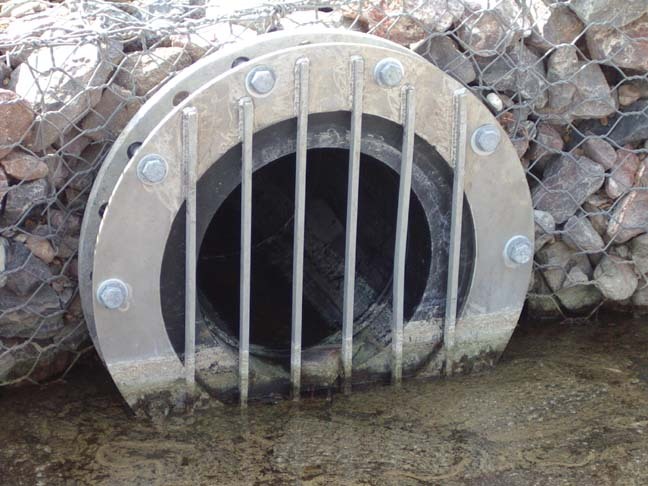 The Environmental Agency opened up the four inch slats and three workers (in two vehicles) supervised the input of seawater into Widewater Lagoon on the high spring tide. Despite this topping up the lagoon, the water level was still fractionally down compared to 11 June 2003. The specific gravity was measured (and double-checked) and the salinity calculated at 35‰ (ppt), which is full strength seawater. This compares to a salinity of 24‰ (ppt) in July 2002. A combination of the input of full strength seawater and the evaporation during the exceptionally hot spell this spring is likely to be the reason. If the fresh seawater is introduced throughout the summer at the current rate, there is a risk that the lagoon will become hypersaline and be unable to support aquatic life. In Widewater Lagoon, several large Common Eels have been seen to the east of the bridge. They could only be seen at the bottom of the lagoon from a very high vantage point on the roof of one of the houses. 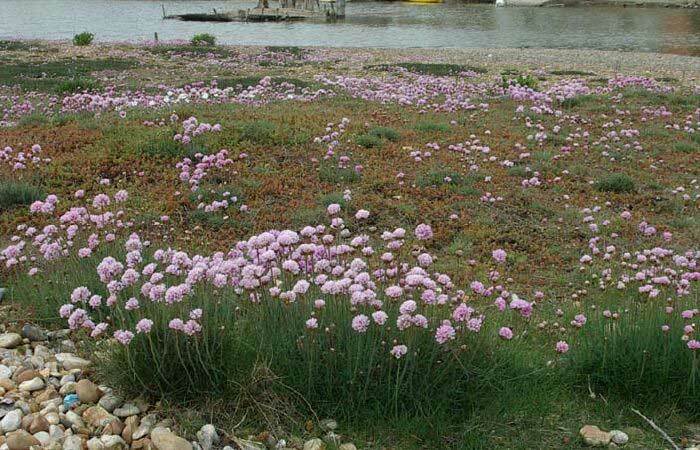 The Sea Thrift has faded and Opium Poppies are the most colourful feature of the lagoon fringes. Stuart Meakins (Environmental Agency) advises me that this was the date the pipeline was first put into operation (by telephone conversation of 3 July 2003). This is a Saturday with a high spring tide of 6.4 metres (WXTides). The pipeline was actually opened on 13 April 2003 at 8:00 pm by the Widewater Pipeline Management Team. However, as this was only at half spring tide of 3 metres at this hour, I assume that the water would not come through until 10:30 pm when the tide reached 6 metres in height. Despite the recent rain, the level of Widewater Lagoon was about 50 mm lower than May and this leaves bare patches of mud. The salinity was measured at 30‰, the same as last month. The resident pair of Great Black-backed Gulls were making a bit of a noise with their shrieking calls. A Small Tortoiseshell Butterfly as noted at the western fringe of the lagoon. A Common Sandpiper was seen at Widewater. The Mute Swans on Widewater Lagoon have seven cygnets this year. Just a handful of Yellow-horned Poppy plants are in flower and the Tree Mallow is now more handsome at the western end of the lagoon. Red Admiral Butterflies and faded Painted Lady Butterflies appeared with a breeze from the south. I only saw a couple of each in ten minutes, but they looked like immigrants and later more of both species were seen near Old Shoreham Toll Bridge. Bird's Foot Trefoil was beginning to flower on the gravel between the lagoon and the cyclepath/promenade, dividing the lagoon from the sea. A Glaucous Gull (1st or 2nd summer), Larus hyperboreas, is seen again at Widewater, Lancing at 10.15 am and again at 11.30 am, when it flew towards the River Adur. The Glaucous Gull is an Arctic species and a rare visitor to southern England. It is a large species only exceeded in size by the Great Black-backed Gull, one of which has been resident at Widewater since the beginning of 2003. The soil and gravel that had been disturbed for the pipeline at Widewater was like a bare desert between large drifts of the Sea Thrift. A pair of Ringed Plovers rose from amongst the Thrift, and flew rapidly away. Salinity in Widewater Lagoon is recorded at a high level of 30‰. Seawater in the English Channel is about 34‰. This is the highest recorded salinity in the last year. The Sea Thrift is now in flower. 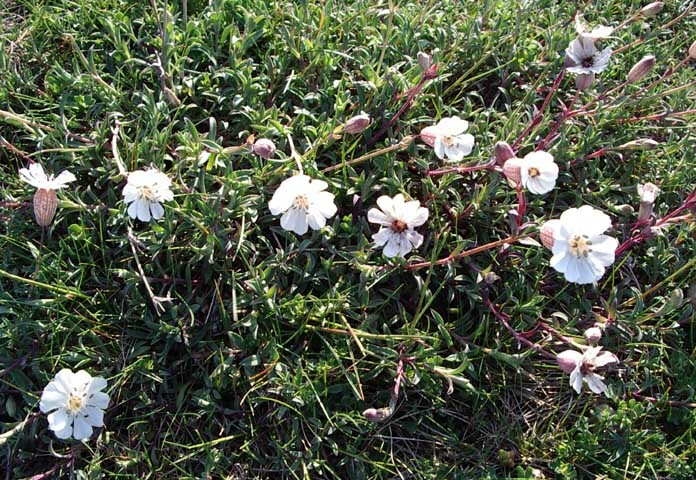 On the Widewater flood plain, on the gravel and soil that had been lifted to instal the new pipeline and then replaced, the Sea Campion was noticeably in flower. 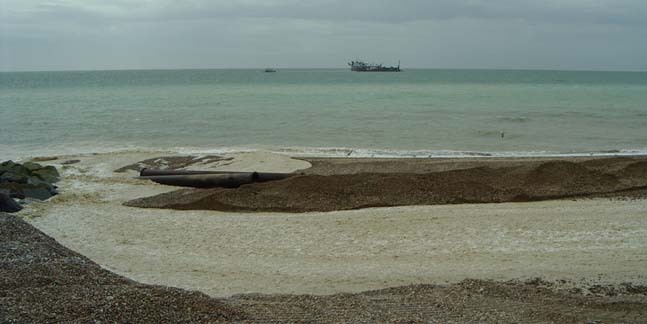 The new pipeline from the sea to Widewater Lagoon has been landscaped and now merges into the shingle bank. After a couple of months of low rainfall, the lagoon salinity rises to a high figure of 25.5‰ (as high as any recording last year). A steady stream of orange-tailed bumblebees were observed flying eastwards over the shingle beach to the seaward edge of Widewater Lagoon. Over a period of two hours, a bee must have passed every 30 seconds and I estimated the total numbers passing at about 136. Later in the afternoon a smaller fly-pass occurred. NB: The species was probably the Red-tailed (Jewel) Bumble Bee, Bombus lapidarius. There were two pairs of Shelducks at the eastern end of Widewater Lagoon. There were five ducks up-ending themselves to feed in Widewater Lagoon (eastern end). Some 25% smaller than Mallards, I have penned these in asTeals. After a month of very little rainfall, I would guess that the salinity would rise slightly in Widewater Lagoon, which was heavily in flood which is usually associated with heavy rainfall. The SG was measured and the salinity calculated at 27‰. This reading represents the largest monthly rise in salinity for a whole year. At the time of writing, I have not checked if the new pipeline is in operation. It was a surprise to see a black Brent Goose wading around the edges and swimming on the surface of Widewater Lagoon just south of the footbridge over the lagoon. The Little Egret was feeding as usual. Black-headed Gulls were standing on the thin layer of ice that covered nearly the whole expanse of Widewater Lagoon, the Mute Swans were restricted to a small area of clear water near the houses. The Little Egret was predictably missing as it would have had few opportunities to feed in the frozen margins. A thin layer of ice formed over the shallow fringes of Widewater Lagoon. The daytime temperature was about 1.1° C and the dew point -4.2 ºC. There was a Kingfisher at the eastern end of the lagoon. Widewater Lagoon is in flood after the recent rain and the salinity fell to 15‰. The Little Egret foraged in the shallows as usual. This bird is not ringed. 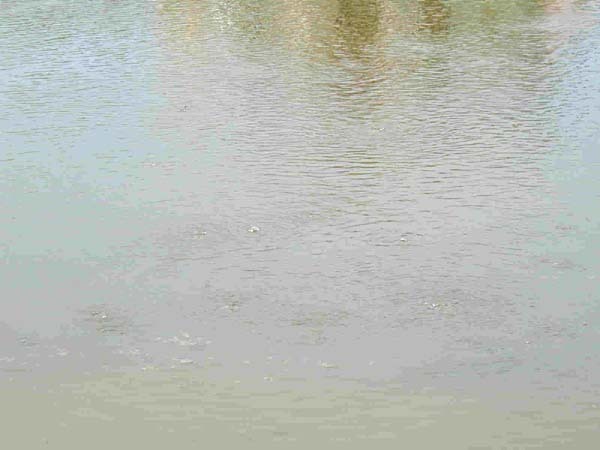 Six Little Dabchicks (=Little Grebes) are spotted repeatedly diving beneath the flooded Widewater Lagoon. On the edge of Widewater Lagoon, a Kestrel took a Goldfinch in mid-flight, hard enough to down the bird before finally capturing it. On the edge of Widewater, a Feral Pigeon probed. This "townie" is uncommon, (except for Southwick Square), not even found regularly at the railway stations in the Adur urban district. It could have been attracted by the feeding of the resident family of Mute Swans (two adults and nine cygnets that were partially white, nearly attaining adult colouring in their first year). The swans quickly swam towards me as I collected by water sample. On the sparsely vegetated artificial island of Widewater Lagoon, a Great Black-backed Gull was doing its best to further denude the vegetation with a large (rabbit-sized) clump of greenery which it flew off with. Near the Information Kiosk by Widewater Lagoon, two uncommon Sussex birds made a brief visit: a single Black Redstart and a couple of Stonechats. It is interesting how the Widewater provides a temporary haven for a large variety of the less familiar birds. 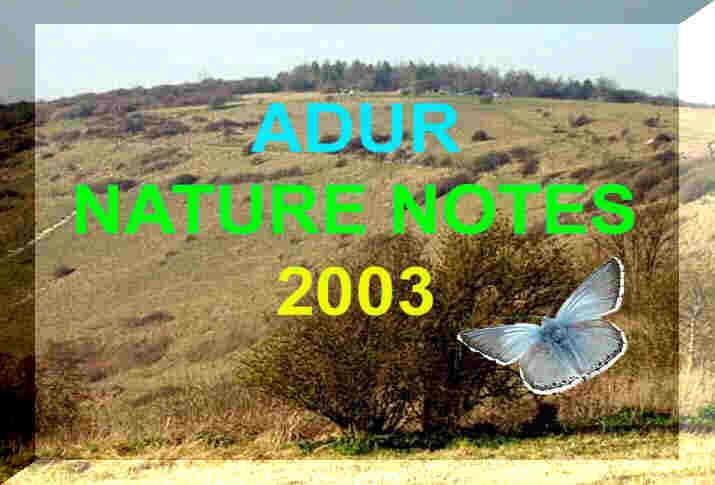 The identity of these birds were confirmed by Sussex Ornithological Society observers. An extra Little Egret was seen on the margins of Widewater Lagoon. Not so little either, these two birds appeared as white herons at first and the appearance of their size is dependent on their behaviour, skulking around the margins makes them appear smaller. One bird seemed to have such pronounced rings on its legs it appeared like it was in plaster. The Little Egret is back feeding on in and around Widewater Lagoon after a break for the summer months. As the high tide reached it's peak at around 12:15 pm the percolation effect could clearly be seen at the western end of the Lagoon. As the rising tide pushes it's way through from the seaward side, trapped air is expelled. In many places the along the southern edge of the lagoon air bubbles rapidly rose to the surface as if the water was boiling. In at least two places, seawater springs emerged from the lagoon edge. Black and green algal growth clustered around the slow trickle. On the adjacent beach, as the sun shone warmly, the sea was flat enough to skim pebbles on the surface. The fear of a low pressure weather system corresponding with an unusual high tide did not materialise. A Comma Butterfly patrolled the sheltered leeward side of the bank while at the top of the bank a Clouded Yellow Butterfly took advantage of the clusters of Michaelmas Asters which also attracted bees to one of the seasons last nectar sources. After a month of minimal rain and with an Indian Summer summer preceding some of the highest and lowest equinoctial spring tides for over 20 years, I visited Widewater Lagoon, 1½ hours after the midday high spring tide of 6.8 metres. The bubbles of percolating seawater had ceased by then and the only water commotion was caused by a small flock of Ringed Plover. There was a band of about 40 cm of wet mud (west of the bridge) where it looked as though the water had recently receded. The lagoon level was higher than that of a month ago, as the separate westerly lagoon was a continuous sheet of water, but still scarcely more than a large puddle. The air temperature was recorded at 21° C and water temperature in the lagoon at 16.5° C. There were thousands of small prawns in the lagoon. The distinctive long-legged spider Tetragnatha extensa was discovered in the long grass near Widewater Lagoon on the sea side. After one day of heavy rain (9 September 2002) and high spring tides, the level of Widewater has risen again comparable to 14 August 2002 with the small western lagoon again filled. It would be useful to have a continual recording apparatus of height and salinity. A recording device was installed, but I understand that it is no longer working. Wheatears are noticeable, one bird flying from from one of the wooden parallel wooden supports to another, prior to their migration to warmer climates. After a dry spell, Widewater Lagoon had receded/dried out and the small separate lagoon west of the western causeway was reduced to a few puddles since 14 August 2002.A live Lagoon Cockle was found on the surface. After finding the Wasp Spider, Argiope bruennichi, on Mill Hill on 18 August 2002, another one almost leapt at me down at Widewater Lagoon (TQ 2008 0415) today. This one was close to the path across the causeway, I wasn't able to get such a good look at it but I think it was a male, about half the size of the Mill Hill specimen. I was distracted for a minute and when I looked back the spider had 'legged it'. Widewater Lagoon was very full of water (depth ? measured at ?) for August which could be explained by the heavy rainfall of the last few days which caused flooding in some places. 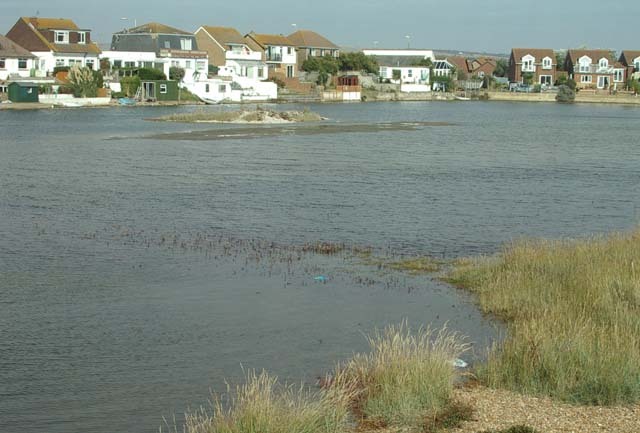 The high tide of 6.1 metres (WXTide Table) occurred at 4.27 pm BST and the air bubbles shooting up through the cracks in the alluvium floor of the lagoon began one hour before the high tide. They occurred as a steady stream of small bubbles and sometimes as large less frequent bubbles and these bubble points occurred more often in the shallow water but also could be seen at the surface in water that was two metres deep. The conjecture is that this is seawater being forced into the lagoon through the shingle bank and the bubbling only occurs on tides of over 6 metres in height. 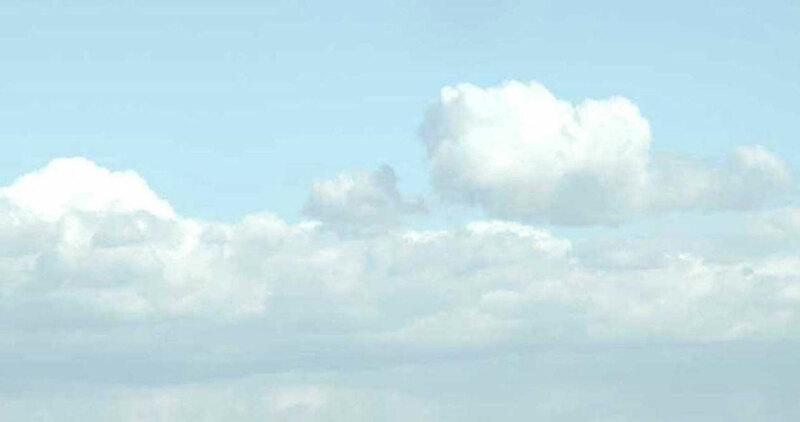 At 3.10 pm I saw some air bubbles in the area approx. 200 metres west of main ridge and spreading a further 100 metres west. There must have been at least 100 sets of bubbles! At least six had water rising at least 25 mm over the level of the Widewater. At this time there were no other areas showing this effect. At 5.00 pm I then witnessed the same again this time some 200 metres east of the bridge and extending another 50 metres east. The bubble form was less pronounced than the previous lot. Tens of thousands of very small (> 15 mm) prawns collected on the lagoon edges amongst the pebbles. Bob Cranborne provided the thin mesh net and the markings on the these prawns could be seen clearly when looking down into the white bucket. They were too small for positive identification with the naked eye. There is a possibility of the Lagoon Prawn, Palaemonetes varians or more likely the Common Prawn, Palaemon elegans. In the surrounds of the causeway, I suddenly spotted a Ringed Plover chick. The two parents were conspicuous, part of their distraction behaviour, and altogether a small flock of about 15 Ringed Plovers wheeled noisily. Wheatears were flying around as well, prior to emigration and the Mute Swan couple were accompanied by nine dirty grey cygnets. A splendid large and distinctive example of a female Emperor Dragonfly buzzed overhead. NB: The pipeline is now finished (written in July 2003) and the internal weir in operation seems likely to handicap most immigrants from the sea, except for small prawns. The black ooze (mud substrate) also revealed Nereis (ragworms), lugworms and other assorted worms. The tiny gastropod Hydrobia was plentiful as expected. There were also a few sediment-dwelling attachment type sea anemones discovered, although these were not Edwardsia ivelli. The miniature sea anemones have been identified as a dwarf specimens of the distinctive Haliplanella lineata with orange stripes which are not found on other British sea anemones. The anemone photographed was only 2 mm in height and 3 mm in diameter and this was typical of the dozen anemones discovered. This alien anemone (accidentally introduced species) is a sea anemone that inhabits harbours and estuaries and occasionally lagoons where the salinity is below full strength seawater. Haliplanella lineata attains at least 20 mm high and 13 mm diameter in British specimens but in other parts of the world could be twice this size. Reproduction by longitudinal fission is habitual and frequent in this species. A Blenny (a small green or grey rockpool fish), Lipophrys pholis, was discovered by S. McKenzie in Widewater near the bridge. This fish would not be able to enter the lagoon naturally at present and would have been introduced by human activity. It was not behaving naturally, it was slightly moribund. This is because of the lowered (corrected) salinity of 24‰ (ppt). These rockpool fish can only tolerate lowered salinities occasionally for short periods when trapped in pools at low tide. If the unfiltered pipeline is introduced, these fish will find their way into the lagoon and unless they could escape through the pipeline, they will die within a few weeks. Gobies, Pomatoschistus, is another fish genus (two common species) that would enter, but these fish have a short life less than two year span, but the first year fry, with a greater tolerance of lowered salinity (entering estuaries in the summer) would still enter the lagoon and die in the first winter. Shore Crabs have an even greater tolerance of lowered salinity, able to osmoregulate better in higher summer water temperatures, but even with this hardy crab, they would find it difficult to survive a winter unless they congregated in more saline pockets. These crabs will predate on cockles and worms in the lagoon mud. The failure to discover even one live cockle was worrying and disappointing. Worrying because the initial thought that it was because of an accumulation of silt that caused thousands of the cockles to die. Another possibility was that the collection area had actually dried out completely during a recent dry summer and the mass mortality was because of desiccation. "As some lagoons are prone to ephemerality it is in their nature to experience wide fluctuations in populations of species. When I have recorded Cerastoderma glaucum at sites I have almost always found many many more dead shells than living. 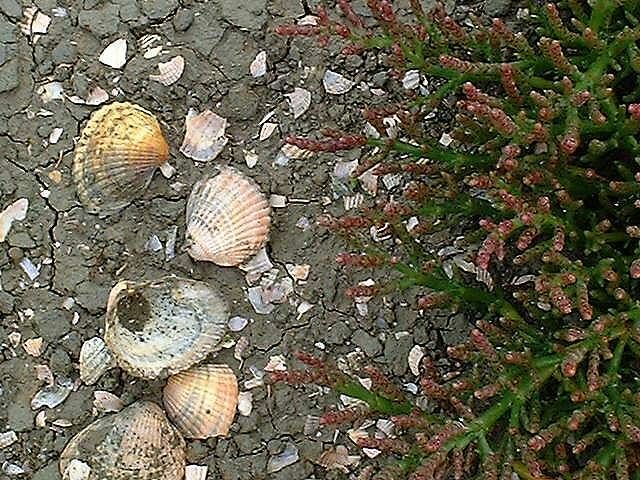 Terry Wimbleton (Havant) of the Conchological Society has observed see-saw colonisation of suitable habitat for Cerastoderma glaucum locally (Dorset to Sussex) and was talking to me about this at a meeting recently." The first green spiky shoots of Glasswort were clear in the boggy and almost dry margins. Floating on the surface the strands of the rooted plant with the scientific name of Ruppia maritima were pointed out. This is an unattractive choking style green flowering point that was present in large clumps. Despite its prominence this is the first record of it on these Nature Notes pages. On Widewater Lagoon, a pair of Mute Swans to the west of the small bridge were accompanied by ten cygnets. The lagoon was in flood after the recent heavy rain. On the shingle bank of Widewater a Ringed Plover flew rapidly towards the seashore. This is a potential breeding are for these small wading birds if they are not disturbed by Crows or dogs. On Widewater Lagoon, a pair of Red-breasted Mergansers shook themselves and dived under the water. The Little Egret was still there fishing in the shallows. A chirm of 20 Goldfinches adorned the shrub on the south side of the lagoon. The chirm of Goldfinches in the shrubbery between the lagoon and the sea numbered about 30 but they were outnumbered by about 100 noisy House Sparrows in adjoining bushes. On a wet and blustery day a small flock of 30 Dunlin wheeled over Widewater. The resident albino Mallards tucked their heads into their breasts. A flock of about 35 Pochards cheered us up in the rain. These ducks appear like a dark blob at first, their grey backs camouflaged quite well against the rippled water, repeatedly diving under the surface. In the shallows a Little Egret was repeatedly feeding right on the edge, probably not on the Three Spined Sticklebacks, Gasterosteus aculeatus, although I am not quite sure what the Egret was stabbing at. This proposal has been abandoned as the anemone may still be extant (May 2002). A couple of the large white ducks, with a bright orange band around their long necks, were Shelducks, which appeared a large duck when they waddled around much larger than the convoy of Mallards, but when on the surface water of Widewater Lagoon the Shelducks appeared smaller. 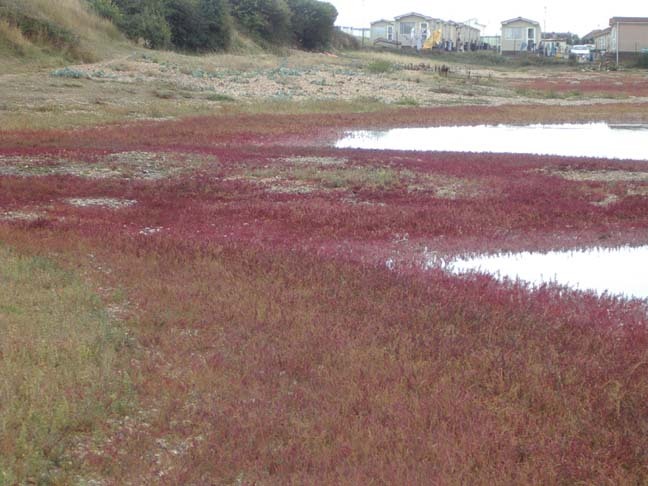 The high tides and rain had filled Widewater Lagoon which looked spectacularly red with the red variety of Glasswort in abundance, part submerged and partly still exposed west of the bridge. At the eastern end a Little Egret fished in the shallows. The flock of 50 plus House Sparrows looked brighter and leaner and I suspected these were immigrants, not the plump overfed resident birds. The Information Booth at Widewater Lagoon (TQ 204 042) is officially opened. It contains a picture display and information by Ray Hamblett and Steve Barker. Widewater Lagoon page (by Ray Hamblett). A pure white moth buzzed around the white beach huts. This was likely to be a Brown-tailed Moth adult (but this was not confirmed). On 28 August 2001, a large female Kestrel was observed leaving a bush adjacent to Widewater Lagoon before flying away rapidly and then soaring. Wheatears, fly to and from over the shingle beach between Widewater Lagoon and the sea, their white rear very distinctive, before this slim bird settles prior to its long migration back to Africa for the winter months. Three birds were seen by the beach huts. There were probably more. A few Red Admiral Butterflies appeared to flutter in from the seaward side, but these butterflies are strong flyers and they may be just be moving from one nectareous plant to another. A pair of Mute Swans on Widewater Lagoon were followed by six cygnets, not cuddly small offspring but large dark coloured first year juvenile birds. My first butterfly (species unidentified) of the year over the shingle on the sea side of Widewater, but attention was simultaneously distracted by a female Kestrel over head, from underneath the pale blue with streaks stood out from the blue sky of the first fine and sunny day of the year. The female looks much larger than a male and could be mistaken for a Sparrowhawk. This bird glided and than paused for the familiar hover, before swooping off on the wind. It is usually the male that is blue underneath. 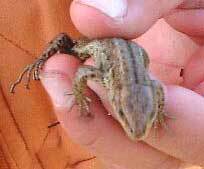 Ray Hamblett reports Common Lizards, Lacerata vivipara, (confirmed ID) and Slow Worms, Anguis fragilis, near the remounts of flint walls and grassland near Widewater. These small reptiles occasionally become the prey of visiting Kestrels. The first immigrant Wheatears make their landfall near the Widewater Lagoon. An oiled Gannet is reported from Widewater Lagoon. This was the first sign of a much greater oil spill off the Sussex coast with scores of oiled Guillemots and other birds. Sussex RSPCA, Tel: 0300 1234 999. A Kestrel was hovering over the grass to the east of the bridge over Widewater, and swooped down quickly, but it quickly rose again so the strike must have been unsuccessful. There was very little evidence of the excessive rain of the last two days, Even Widewater Lagoon had not risen to a flood warning extent, although all the flood plain was sodden. The white faces of five Coots on the lagoon were immediately noticeable on a sunny shirt-sleeves day. These birds, in the 1970s were abundant on the Adur estuary had declined in recent years and were sometimes absent altogether. However, my attention was quickly distracted by a colourful male Kestrel taking off from a stump or a patch of dryish grass to the east of the bridge over Widewater, flying west so it was hidden by the Tamarisk bushes. Birds are on the move all over the Adur area, with a flock of about 50 Wheatears flying over the beach next to Widewater prior to their southerly migration. The lagoon was hosting 30 Mute Swans. A Little Egret dipped his beak in to feed repeatedly in the cockle lagoon (to the west of the bridge) (TQ 200 042), part of Widewater Lagoon. Its prey could have been 3-spined Sticklebacks, which are commonly seen in the shallows from the vantage point of the bridge. 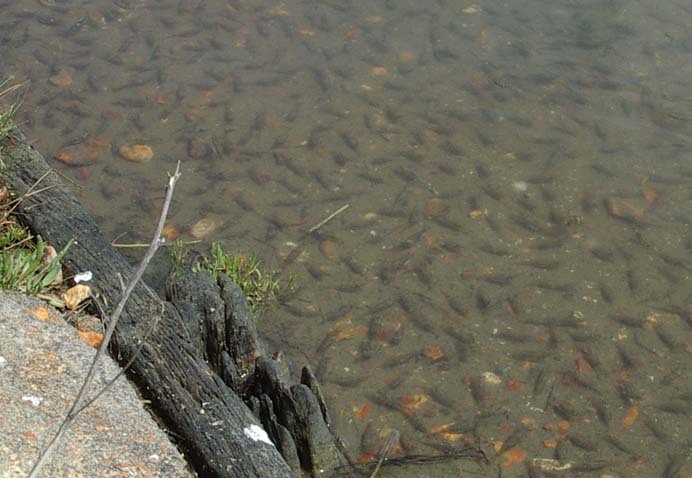 (The presence of the sticklebacks are not confirmed by this report.) I had not seen a Little Egret on the River Adur (estuary) this year, but the young Bass shoals were not as numerous as in the special year 1999. The first few Goldfinches and Greenfinches returned to the fringes of the lagoon. Several thousand House Martins swooped to and fro over Shoreham Beach in an acrobatic prelude to their annual migration to warmer climes. By the following day they had all left. Widewater Lagoon has been treated to a visit by the Australian Black Swan, Cygnus atratus, which must be living in a semi-wild state, as it is not part of the British avian fauna. It is about half the size of the familiar white Mute Swan, Cygnus olor. These swans often inhabit the Swiss Cottage Lake in Shoreham-by-Sea. A Common Gull, Larus canus, was observed by Andy Horton (it was pointed out to him) through a powerful telescope, at Widewater Lagoon near Shoreham-by-Sea, Sussex just after midday standing on a pole in the brackish shallows. This particular bird was in adult plumage and distinguished by a particularly prominent black tip to its beak on the left side, and a lesser smudge on the right beak. The legs of this bird were bright yellow. The black beak markings of the juveniles are not included in most popular books with the notable exception of the "Reader's Digest Nature Lovers guide on British Birds." The clearly viewed markings on the right hand side of this bird were consistent with the Common Gull and not the ringed bill of the rare American vagrant the Ring-billed Gull, Larus delawarensis. The American bird has a Herring Gull-like thicker bill. This vagrant bird has been reported on six occasions from Sussex during the 1980's. NB: I am not so sure now. I have just discovered a photograph that looks a bit like the gull on Widewater. Subsequent observations of Common Gulls do not have such a pronounced black band or any sort of mark on their beaks so the original identification of a Ring-billed Gull seems at least fair, although I was never sure. (AH, winter 2003). 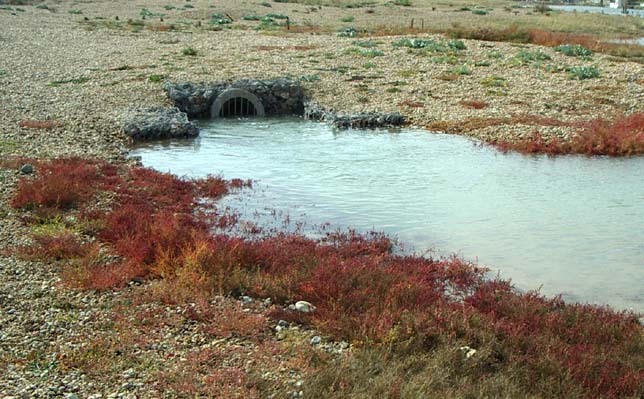 The Habitat Action Plan for Sussex on Saline Lagoons has been published by WSCC. 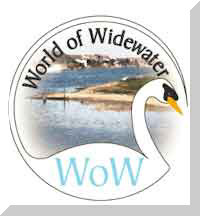 Widewater has not been designated a Site of Special Scientific Interest (SSSI). It is a Local Nature Reserve.